A large unidentified bug my wife found in the sink. Can anyone identify it? 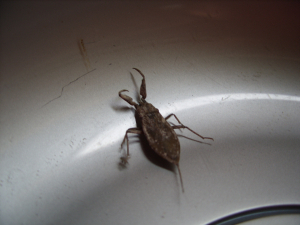 Observation - A large unidentified bug my wife found in the sink. Can anyone identify it? - UK and Ireland. Description: approx 50mm long and flattened itself when she tried to take it out. When it did this it looked very much like a leaf. approx 50mm long and flattened itself when she tried to take it out. When it did this it looked very much like a leaf.